The Keansburg Connection: Jersey Diggs Published a Great Article on Keansburg! Jersey Diggs Published a Great Article on Keansburg! Nicknamed the “Gem of the Bayshore,” Keansburg, New Jersey, is a beachside borough in Monmouth County less than 50 miles from New York City. Keansburg was battered by Superstorm Sandy in 2012, and it is still recovering, but great progress has been made as well, attracting events and investments that match the commitment of Keansburg’s earnest residents. Home to the oldest amusement park in the state and two miles of beach with views of the Manhattan skyline, Keansburg has a small town feel and big-time potential. Originally the home of Lenni Lenape Indians, the area was settled by Europeans in the 17th and 18th Century and what is now Keansburg became a farming and clamming community called Granville–a nod to the grain industry. In 1884, a local pastor petitioned for a post office to be built in Granville and sent a list of 132 names to John Kean of Elizabeth, a candidate for Congress. The new post office was approved and the petitioning pastor’s wife became Granville’s first postmaster. And the borough was renamed Keansburg in honor of John Kean. Officially formed as a borough in March 1917, Keansburg is celebrating its centennial this year as well as experiencing a real renaissance. 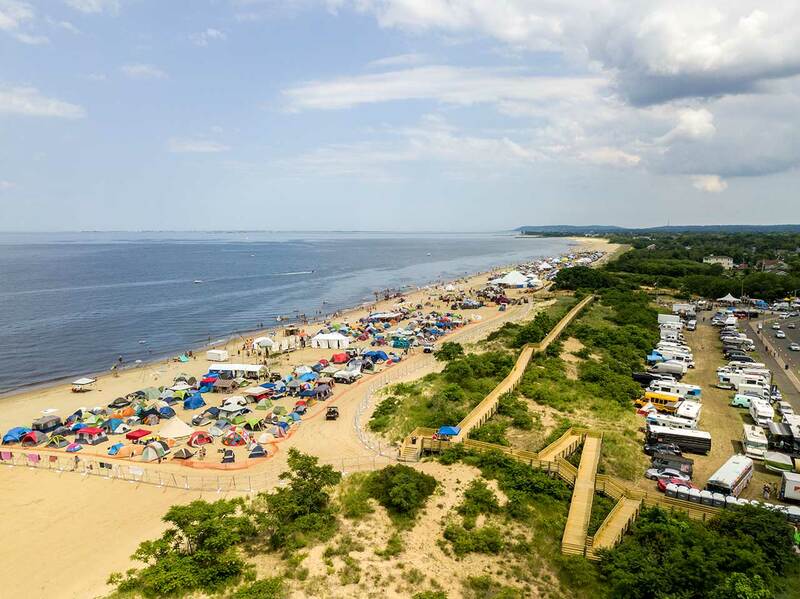 Gratitude Migration, a three-day festival on the beach, returned this summer for the third year in a row, bringing city-dwellers from Manhattan and Brooklyn to the Raritan Bay coastline for the weekend just as steamships did at the beginning of the last century. William Gelhaus was a major investor in Keansburg, building the Keansburg Amusement Park in 1904 and primarily founding The Keansburg Steamboat Company in 1910, offering roundtrip service from Battery Park to Keansburg for 50 cents–$12.45 today. Now, Keansburg is easily accessible by New Jersey Transit trains and buses as well as Academy bus lines and a New York Waterway Ferry from New York City that stops at nearby Belford. Mr. Cliff Moore, an extremely active resident who is not only a local restaurant owner but also an Economic Community Development Coordinator and the founder of the Keansburg Business Alliance, admits Keansburg was down and out even before Sandy. Over $65 million in construction is currently underway and another $25 million is planned or on the drawing board, according to Mr. Moore. Among the new developments is Cove on the Bay, 184 luxury rentals and 10,000 square feet of retail, and Pier 260–a three-story restaurant with a rooftop bar and view of the City skyline. A condominium project offering over 200 residences is undergoing approval and Keansburg will also soon be home to the brand new Raritan Bay Brewery, opening this fall in a one- hundred-year-old building. “A new state-of-the-art police department is under construction as well as several new homes and improvement projects. Keansburg just built and opened a new school last year and is evolving into a year-round community,” said Mr. Moore. A new Recreation Department was also formed and planned over 50 beach events this year, including a Farmers’ Market, free movies, yoga, and free concerts.